Escape to The Lookout and discover the wild west of the Dingle Peninsula. A beautiful home off the beaten track overlooking Smerwick Harbour in all it's glory with magnificent views of the Atlantic, mount Brandon and endless white sands. With three bedrooms, three bathrooms and two lounges it has plenty of space to relax including a glass balcony perfect for a morning coffee or sundowner while taking in the rhythm of the ocean. 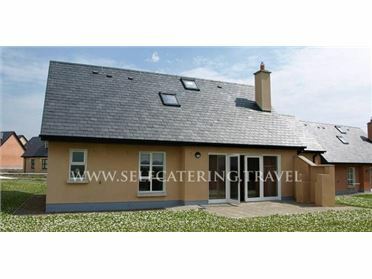 Pet Friendly and a walkers paradise with the three sisters, sibeal head and bÃ©al bÃ¡n beach all walkable from the house. The lookout has a spacious lounge downstairs with a wood burning stove, bay window and french doors leading out into the garden with impressive sea views. There is is also an upstairs snug area with a corner couch and reading lamp to give everybody a space to unwind. A unique hand crafted kitchen with walnut worktops and exquisite detail. There is a fridge feezer, oven, electric hob, microwave, kettle, toaster and Dingle handmade crockery. There is a seperate utility room with a washing machine, tumble dryer and extra storage. The kitchen leads through to a seperate dining room with french doors that lead to the garden and picnic bench. The contemporary dining suite is also handmade here on the peninsula. The lookout has a large family bedroom with an en suite, a double and a single bed. The master bedroom has a fabulous walk in wardrobe, quirky en suite and a balcony accessible from two sets of french doors. The two upstairs bedrooms have velux window so are filled with natural light and again epic views. Downstairs next to the family bathroom there is a tastefully furnished twin room. There are three bathrooms. Downstairs is a family bathroom with a bath/shower, sink, toilet and storage. Upstairs there are two en suites adjoining the two bedrooms both with a shower, sink and toilet.